Jewish mobsters, “The Purple Gang” were criminals but still made it to Temple to seek forgiveness for their sins on Yom Kippur. The year was 1929. The Roaring 20s were coming to an end, and a new decade anxiously awaited the world. The date was October 14th. A mere 15 days before one of the most devastating of days when the bubbles of the stock market’s booming champagne that had lasted for years after World War I finally exploded, and the United States and the world entered one of the most difficult financial crises it had ever known; the Great Depression. The place was Detroit, Michigan. A city of growth and power thanks to the new and booming automobile industry that had found its home on the banks of the Detroit River and Lake St. Clair. Henry Ford was there. The Dodge Brothers, Walter Chrysler, and many of the country’s greatest engineers and inventors were in Detroit, changing the world year after year. Jobs were plentiful, unions were powerful and the city was wealthy. The perfect breeding ground for a criminal underworld. What was happening on October 14, 1929? Yom Kippur, the Jewish fast that is the most solemn day of the year for the Jewish people. It is on Yom Kippur, “The Day of Atonement,” that Jews are forgiven of their sins by fasting in many various forms. Yom Kippur services are also held throughout the day at synagogues and on Yom Kippur in Detroit in 1929 at Orthodox Congregation B’nai David, this was as it had always been. Except for the three gangsters attending service. These men, Louis Fleisher, Harry Fleisher, and Henry Shorr, were all members of The Purple Gang, a mob based in Detroit primarily made up of Jewish members. 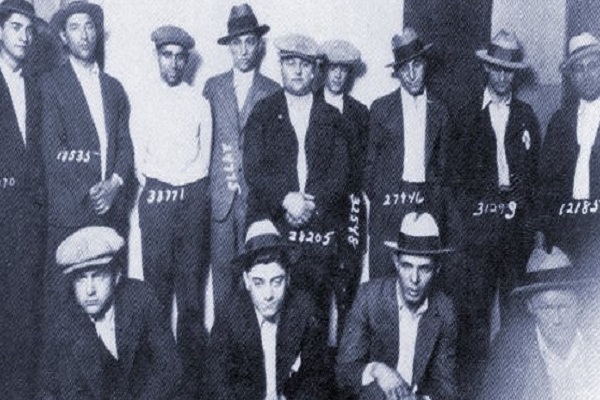 The Purple Gang were active in all areas of metropolitan crime in the 1920s and Prohibition:gambling, smuggling liquor, and would often act out and retaliate with brutal violence to anyone who stood in their way. Still, when it came time to go to temple and pray and fast for the forgiveness of sins, many Jewish gangsters across America observed the holidays, performed the rituals, and kept their faith very close. The children of Eastern European Jewish immigrants to the United States at the turn of the 20th century, many of these gangsters maintained their strong identities and ties to the Old Country and to the religion which meant so much in their homes and communities. In his book, But He Was Good to His Mother: The Lives and Crimes of Jewish Gangsters, author Robert Rockaway found that many of the Jewish gangsters in America during the 20th century were able to find ways to separate themselves from their work, meaning what they did for their “business”was separated from who they believed themselves to be. Which would make sense, considering many of these gangsters would commit heinous crimes that were not only against the laws of America, but also against the laws of Judaism. By attempting to separate their personal identities from who they were as professional criminals, Jewish gangsters like the Purple Gang’s Louis Fleisher, Harry Fleisher, and Henry Shorr felt right at home in the pews of Yom Kippur service in Orthodox Congregation B’nai David of Detroit in October 1929.